Artistic Director, Catrina McHugh was nominated by Rattle Snake director, Charlotte Bennett for Put Her Forward. put her forward is an artwork by non zero one that recognises living women who have done remarkable things to positively impact the people around them. There are 925 public statues in the UK. 158 of these are women, and of these only 25 are of non-mythical, non-royal women. There are more statues of people called John. There are more statues of goats. With your nominations we aim to double the statues of non-mythical, non-royal women in England by September 2018. The public were invited to nominate living women who they thought should be recognised for the positive impact they have had on others. Up to 25 women will be selected from these nominations, to be 3D scanned and printed into small sandstone figures. The unveiling happened this afternoon at Newcastle Castle with an emotional speech from Catrina and speeches from ‘non zero one’ and Deputy Leader of Newcastle City Council, Joyce McCartney. Thank you to ‘non zero one’, the council, Newcastle Castle and everyone who turned up to support Catrina and the company last Thursday. 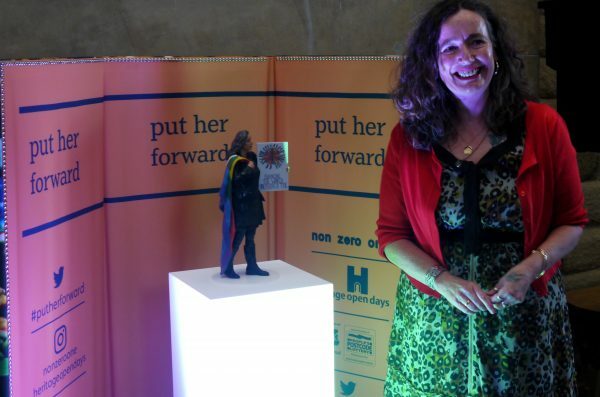 You can read about the statue and how Catrina felt about receiving the award here!